Before reading this book, I had heard a lot of good things about Wilbur Smith, but Predator is the first of his books that I have read. 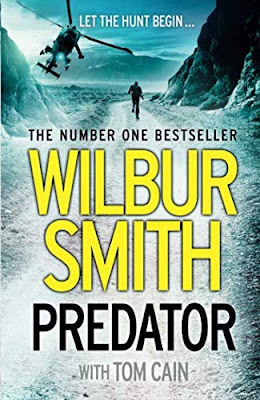 Predator is the third book in the Hector Cross series (yes, I know - breaking my rule of not reading books in a series out of order!) but I feel it gives sufficient background to be read as a standalone too. Fast-paced, high-drama thrillers like these are often a bit of a marmite genre for me - I seem to either love them or hate them. While I definitely didn't hate Predator, sadly, I didn't enjoy it as much as I hoped I would either. I struggled to find myself invested in the storyline and didn't really form any personal attachments to any of the characters, which left a big disconnect. This isn't to say that the characters were not fully formed - because they were - I just couldn't connect to any of them on an emotional level, which is important to me when reading. Of course, the stakes were high and the plot hurtled along at breakneck pace, but for all the action and adventure, actual engagement with the story was low. I struggled to get through the book and had to make myself pick it up to keep on reading more than once - definitely not a good sign. Predator covers a lot of ground and in my opinion, could have benefitted from being simplified in order to allow more time to focus in on various parts of the story. As a result, I felt the beginning was too drawn out and the ending was too rushed, making it feel a little anticlimactic. Predator is available to buy now. Have you read the book? Let me know in the comments below!